Not very complicated but a new top to wear. And I did wear it, on a work trip just 2 days after I finished it. I think it will get a lot of wear. The fabric is a brushed polyester knit, which is very soft. I think it might have been a remnant purchase from Britex, many (many!) years ago. I'd always envisioned it as a top and now it finally is one! 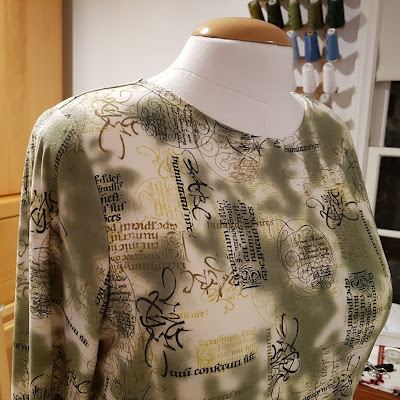 I used the same pattern that I've used for two other t-shirts, so this made it a very quick and easy project. Pattern used: Model #38 from Sabrina Woman (German) issue 3/13. This is the same issue as Modellina (Italian) 152, Elena Couture (France) 62, Fashion Trends (Netherlands) 11, and Tendencias de Moda (Spain) 11. Sizes: European 36-46. I made my usual alteration of a 42 in the bust/shoulders to a 46 in the waist/hips. Construction: I didn't use the instructions in the magazine because this was very simple to construct. 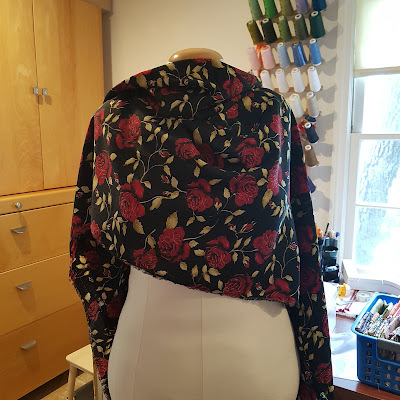 I used fusible stay tape in the shoulder seam, and then serged the shoulders. Next I serged the sleeves - I find it much easier to put sleeves in flat on knit tops. Then I serged the side and sleeve seams and used the coverstitch for the sleeve hem and bottom hem. Finally, I turned the neck edge under and used a coverstitch. I'm switching gears for my next sewing project. 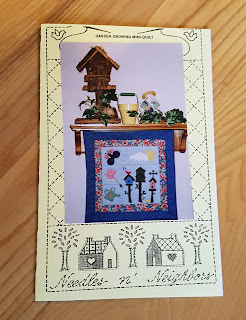 While unpacking and organizing my sewing stuff I came across two appliqued mini-quilts I made at least 15 years ago. 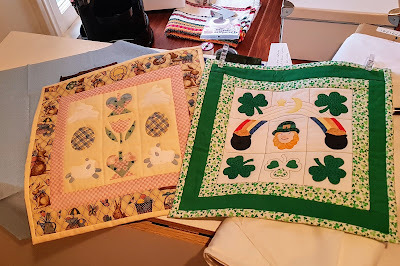 I have picked out the cotton prints I will use, but alas, I don't have (or couldn't find) the fusible webbing to use for the applique pieces. I might have thrown it out or given it away when my craft stuff went into storage. Amazon Prime to the rescue! A package of Steam-A-Seam 2 should arrive tomorrow. 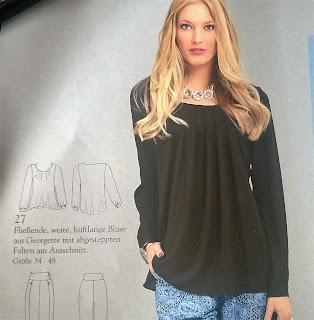 My next garment project will be a blouse, which will also use a Sabrina Woman magazine pattern. The fabric I plan to use was purchased in Germany at the Karstadt department store. I miss that store - I'd buy my sewing magazines in their news stand, have lunch in their restaurant, check out the housewares section (excellent German knives and cookware!) and then browse the fabrics. They had such a great remnant section and fantastic sales. If you bought the last of the bolt they discounted it - Joanns certainly doesn't do that! Anyway, the fabric is rayon (viscose in Europe). Those quilts are GORGEOUS! 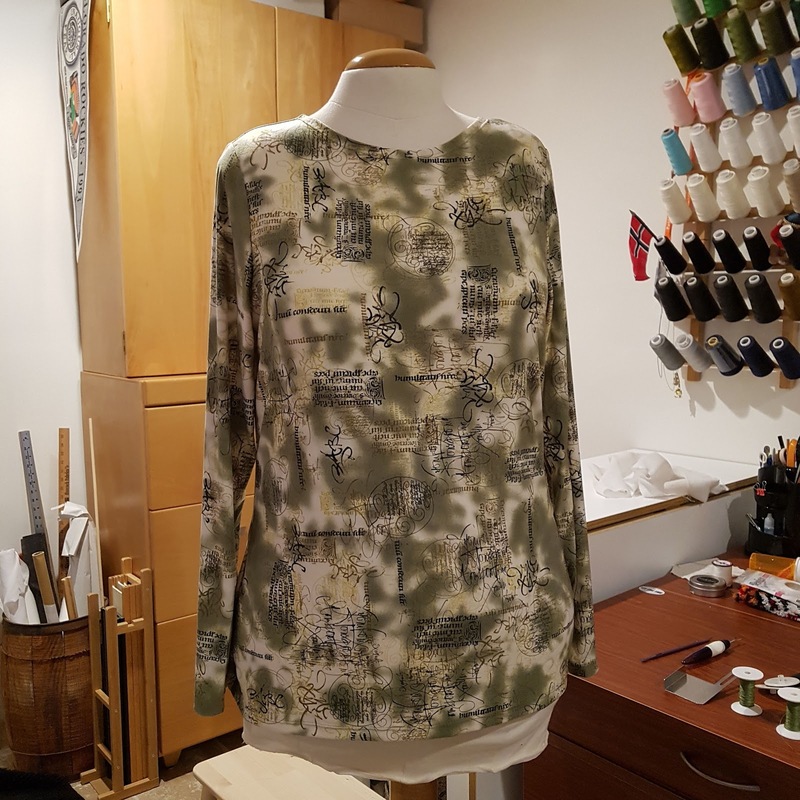 Can't beat a quick and easy sew that is a knit top - looks great.